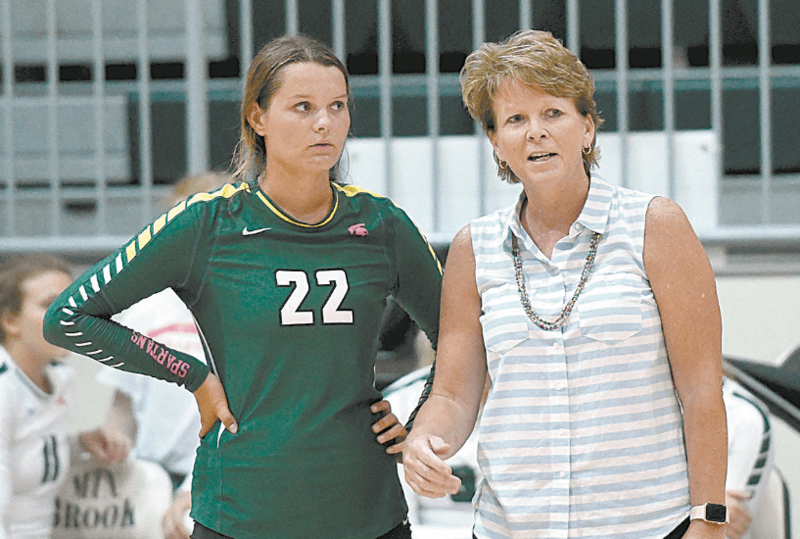 Mountain Brook volleyball coach Vickie Nichols with Liz Vandevelde. Journal photos by Mark Almond. Mountain Brook volleyball began the 2018 season with no seniors, heavily reliant on its junior class for success. Now the team is headed into the postseason ranked second in the state behind the strength of that big junior class. Grace Carr, Ann Vandevelde and Ellie Dayhuff are the captains on this squad. Carr has 94 kills, Vandevelde has 196 assists and Dayhuff has 37 kills. It’s been enough to place the Spartans in a solid position to give the state favorite, McGill-Toolen, a run in the postseason. Dayhuff also has 12 blocks and 4 digs. Carr also has 10 aces, 6 blocks and 62 digs. Vandevelde also has 10 aces, 7 kills, 2 blocks and 55 digs. Mary Catherine Fowlkes has added 38 kills and five blocks, while Liz Vandevelde has one ace, 79 digs and 8 assists and Evelyn King has five aces and 82 digs. Mountain Brook will host the area tournament after sealing the top spot with a victory over John Carroll to end the regular season. The Spartans lost just one area match, to Spain Park. The top two teams at the area tournament will advance to the superregional at the Von Braun Civic Center in Huntsville later this month. That takes place Oct. 25-27, with the state tournament following Oct. 31-Nov. 1. “The biggest deal for us right now is to stay consistent and play together,” Nichols said. “We’ve done a good job of being resilient and being able to bounce back when we aren’t doing so well. When we have found ourselves in a hole, we’ve done a good job of climbing out. But we need to be more consistent so that we don’t find ourselves in holes to begin with.